Twitter OR Facebook, or Twitter AND Facebook? As you may have noticed from glancing elsewhere on this page, I have a Twitter feed. I’ve been posting to the microblogging service for about three years now (I joined in April 2008), and it’s fair to say I’m rather more active there than I am here—I average around five tweets a day. I also have a Facebook account. I am not one of those ‘bookers who straddles Mark Zuckerberg’s parallel world and the real one for most of their waking hours—on average, I post one or two status updates a day there, and may occasionally share a link or video that caught my eye. A significant proportion of my Facebook updates are “cross-posts” from Twitter (thanks to the “Selective Tweets” Facebook app), which saves time and effort if I want to say the same thing to different audiences. A couple of years ago, there seemed to be endless debates in the media over Twitter and Facebook: whether one was “better” than the other, whether one would replace the other, whether you should use one or the other and not both, and so on. This “A/B” way of thinking always baffled me. 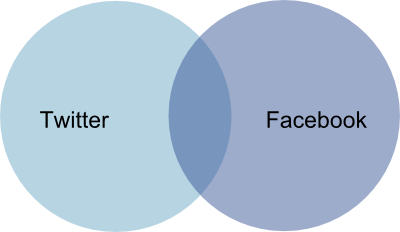 The way I have used both services, I don’t see Twitter and Facebook as competitors, but as complementary to each other—like a Venn diagram. The other important factor regarding my use of Twitter, is that I treat it as public, and assume that anyone could read it. In practice, this means that I try not to simply dump any thought or viewpoint there; in particular, I try not to refer to my work, politics (that’s a tough one for me) or other topics which, if I splurged straight onto Twitter, could land me in an awkward situation. I can’t say I’m always successful in this regard, but I try my best! Associated with the “public forum” issue: I also make a point on Twitter of not being too specific about where I live. I guess that someone who really wanted to find out, could piece together enough of the “jigsaw puzzle” of items in my Twitter feed, to make an educated guess, but on the whole I prefer to maintain a bit of an air of mystery on the location front. With this in mind, I feel more free to be open on Facebook regarding where I live, where I happen to be, what I’m doing at the time, and so on, although even then, I won’t just tell everything there (re. the “Please Rob Me” site story—it’s the same reason I refuse to join FourSquare). Twitter (my wider circle, and the rest of the world). This breaks down a bit in a few areas (e.g. some of my friends are on both Twitter and Facebook), but overall, I think it holds. One more aspect of Twitter that I love, is that it can help you make a kind of contact with well-known figures in their field. Since joining Twitter, I have exchanged messages with at least three British comedians, received a “follow” from a former member of a prominent English prog-rock band (though its leader bristles at the “prog” label 😉 ), and as I hinted recently, received the opportunity to review a pretty desirable gadget—all of which I could have done without Twitter, although the chances would probably have been against it. Perhaps, in some less-central corners of the Web, the debate over “Twitter or Facebook” still smoulders, but for me at least, it’s “Twitter and Facebook… and, I’m glad to say, it always has been. I find this very interesting. I held off a long time before joining Twitter, because I couldn’t work out how I should use it. Short form blog for things I don’t have the time to blog about seems a really good approach and is the one I’m trying to use too. And, you’re right, it’s very, very hard not to enter into political discussions. So far I’ve only slipped up once! Hi Dave – I’d almost forgotten writing this post, so thanks for reminding me 🙂 Interestingly, I took the opposite route to you: I didn’t join Facebook for ages, as I had to “see the point” – it fell into place once I found a use for Facebook (as I outlined in the article). If anyone asks me what the point of Twitter is (usually when they’re also Facebookers), I explain how I see the two services as complementary but different, but in the end I’m not “evangelistic” about it all – if someone doesn’t “get it”, that’s OK!